This is an authentic Greek recipe from Mercin Karris of Midland Michigan. She made this for her family and the annual Greek Festival in Saginaw Michigan. When I made the recipe her husband George would critique it for me. I have enjoyed making this for 30 years with heartfelt appreciation for George and Mercin. In a large saucepan combine the sugar, water, lemon and cinnamon sticks. Whisk together and heat to a simmer. Continue simmering uncovered. Keep an eye on this as you proceed with the baklava. The goal is to have room temperature syrup that is the consistancy of Karo syrup. As you complete the baklava, cool a tiny amount in the freezer. Then place a drop on your thumb nail. This drop should not roll off. Add the ground cinnamon to the chopped walnuts and mix. Use a shallow baking sheet measuring about 14 inches x 18 inches x 1 1/2 inches. Brush the bottom and sides with butter. Compiling the baklava involves layering the leaves of phyllo and brushing each layer with melted butter. You should use at least 1 pound of butter, but not over 1 1/4 pounds. For the bottom layers, place 6 leaves of phyllo brushing each layer with butter. If the leaves are too large for the pan, fold the excess towards the center. Switch sides of the folds to make an even pastry. 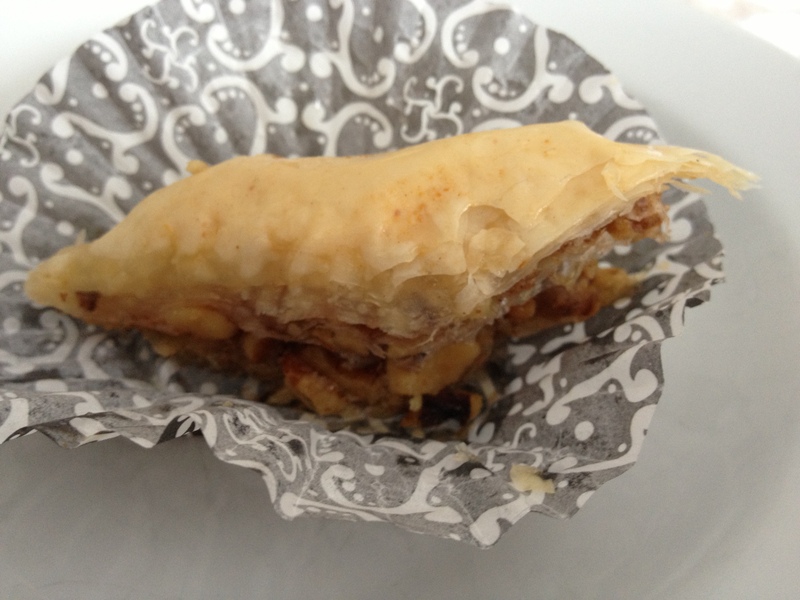 The center layers continue with phyllo and butter with the addition of 2 or 3 handfuls of walnuts sprinkled on top. As you make several layers with nuts, count out the last 6 layers of phyllo. These are the top layers and should be phyllo and butter only as the bottom layers without the nuts. Before baking, cut the baklava. Your skills for cutting and visualizing even measurements determines how you go about this. You can use a ruler if you want. I use dental floss to mark out 6 lengthwise strips. Then I use a sharp paring knife to cut these strips. Then I use the dental floss to mark out the diagonal corners across the baklava. Cut through this center diagonal line with the knife. At this point I use my eye to cut the remaining strips in parallel to the center diagonal. 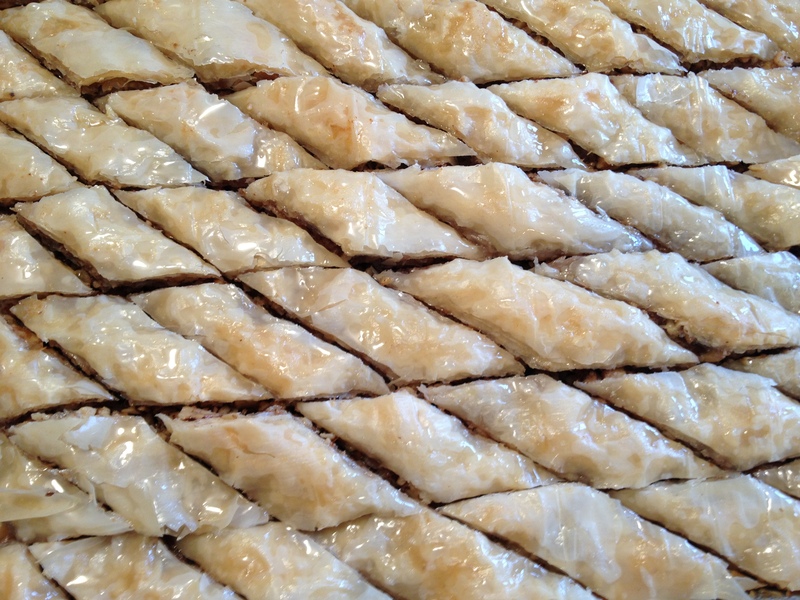 The end products are diamond shape baklava measuring about 4 inches by 1 1/5 inches. If you want smaller pieces, start out with 7 or 8 lengthwise strips. Before baking, check your syrup. If it is ready, pour into a ceramic bowl and add honey. Cool quickly to room temperature over ice. The goal is to pour cold syrup over hot baklava. Set the syrup aside to cool. Place the baklava in the hot oven. Sprinkle a wet hand of water over the baklava to promote a crisp crust. Bake about 30 minutes or until just starting to turn a light toasted color. Do not overbake. Remove from the oven and recut with a sharp knife. Pour the cold syrup over the hot baklava. Cool overnight before serving. Syrup absorbs into pastry as it cools. Wait to serve until there is no more syrup pooling in the baking pan. You can use pistachios instead of walnuts. Another flavor to sprinkle on is rose water just before and/or after baking. Posted in Breads and Baking, Cakes and desserts and tagged fillo, Greek, phyllo, pistachios, rose water, walnuts. Bookmark the permalink. Sorry I missed this post 🙂 The secret is real butter, lemon and cinnamon in the sauce, and leaving the walnuts in pieces, not minced to a powder. That bal;ava you made, Nina, was the BEST ever! !